Soon after the fall of the Berlin wall, American political scientist Francis Fukuyama declared that the moment signalled ‘the end of history’ and the absence of alternatives to the neoliberal hegemony. For ruling elites, Margaret Thatcher’s assertion ‘there is no alternative’ was unquestioned. The next decade in Australia saw John Howard in office continuing to roll out the ‘economic rationalism’ first introduced by Bob Hawke and Paul Keating, in addition to dog whistling to his Right – taking up the policies of Pauline Hanson and regaining much of the constituency he’d lost to One Nation. Politics seemed grim, and many on the left were despondent. But in November 1999, a watershed moment occurred in the heart of world capitalism – on the streets of Seattle, in the United States – when Teamster unionists, environmentalists dressed as Turtles and many others joined forces to dispute that there was no alternative. Their target was the World Trade Organisation meeting, which was negotiating a new round of free trade agreements, and their blockades of the venue and mass rallies shut it down. That story of dissent against multinational corporations, and the government structures that facilitate them, was not just to be the story of the US however; or only the story of Prague, Davos, Genoa or Gleneagles. It is our story too. Thirteen years ago we saw magnificent protests in Australia that both criticised the way the world was, as well as imagined a different future. ‘Another World Is Possible’ was the slogan of the World Social Forum, and it reflected sentiment around the globe. In Australia the Global Justice Movement exploded at the s11 protests, when we blockaded the Asia-Pacific Summit of the World Economic Forum at Crown Casino in Melbourne – and 20,000 people shut it down. It was a protest that said no to the ruling class agenda of prioritising profits above people and the planet, and it was a celebration of the diversity of those who imagined a different world. Similar events and movements across the globe questioned the structures and the priorities of capitalism – if in confused ways at times – and it was the formation of a global anti-systemic movement. As everyone in this room knows, on the first anniversary of the s11 protests, an extremist fragment of political Islam took such dramatic action that their message about American hegemony would become a defining point for a generation. The events of September 11 in New York and Washington started a path that took us to both the invasion of Afghanistan and Iraq. It is now eleven and ten years respectively since the coalition of the willing – the coalition of the killing – began wars that saw millions killed, maimed and injured. And we cannot yet fully talk of the legacy of those actions, as those wars and interventions are not complete. The social, political and humanitarian ramifications will be felt for generations. Today is a day to recall the human cost of all of those harmed, those displaced, and those whose lives were irretrievably changed. In our federal parliament, all the parties except for the Greens lined up behind George W Bush, John Howard and Tony Blair. However, today is also a day to recall the largest protests in human history ¬– to recall that millions marched to say no to the Iraq war. While the protests against the invasion of Afghanistan were smaller that those against the invasion of Iraq, we should not forget that public opinion in Australia was turned around in the course of the occupation, and in the years after invasion polls indicated a majority of Australians wanted troops brought home from Afghanistan. 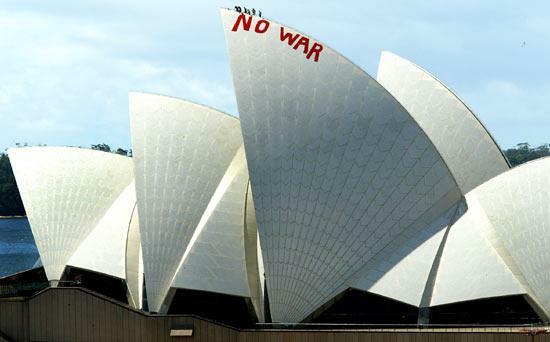 A million people protested against the launch of the war on Iraq in major cities and tiny rural towns around Australia; the largest demonstration, of about half a million, took place in Sydney. The protest that day at Hyde Park, that wound its way through the City to the Domain, was unforgettable. An unforgettable rally even for those, like me, who never even got to leave Hyde Park to march anywhere, such was the size of the demonstration. But there are some difficult questions for the Left to ask in the wake of the massive success of those protests, about their failure to stop the war in Iraq. And in particular, reflecting on the fact that these protests occurred on the back of the Global Justice Movement. We must ask ourselves why the movement did not stop the war; why the biggest protests in history, locally and globally, did not stop the invasion of Iraq. Relatedly, we must ask where the movement went – why we did not maintain large protests or a substantial ongoing movement and why, simultaneously, the Global Justice Movement collapsed in Australia. So why didn’t the movement stop the war? The war was a choice of the leading imperialist power, the United States, and its allies, as part of a strategic plan for the Middle East. It polarised nation-states worldwide on which side they should fall, and in some cases there was a reaction against the intentions of the US – especially in France. In most cases, the ruling elites defied popular will and went along with their initial choice to back the US. At the time the stakes were too high, and for many in the ruling class the Bush plan seemed a game-changer. A very different kind of game-changer to what eventuated. In terms of the movement, there are lessons to be drawn. The coalition that mobilised against the war was the biggest block of forces ever: it included imperialist states such as France, Russia and China, as well as the millions in the streets. Its participants were everyone from concerned conservatives to large sections of the Muslim community, and from small ‘l’ liberals to revolutionaries. But even a movement as diverse as this was not enough. Two issues seem important here. First, while there was mass opposition to the war there was the relative stability of the economy and Western Governments – that is, the Bush, Blair and Howard governments were not yet on the nose politically in their home countries. This gave the US, UK and Australian governments significant room to manoeuvre. Secondly, the success of a movement does not only depend on coalition-building, but also on the existence of a radical minority that will disrupt the war effort in a sustained way, and the social weight that this radical minority possesses. This second part of the necessary movement was absent from our actual movement. It is my view we needed both. In some ways the objective circumstances were there for such a radical minority to work and gain greater social weight – in the form of the Global Justice Movement – but this is not what occurred. Such elements didn’t or couldn’t initiate a movement that would substantially disrupt the war-effort: the social forces and the politicisation for something like that was absent. A successful antiwar movement depends on both coalition-building that is ongoing and deep-rooted, as well as radical elements willing to disrupt the war effort in a sustained way. This, of course, raises a question as to whether the coalition we built – a coalition that did mobilise a million people in Australia – was one that was ongoing and deeply rooted in our communities, one that developed multifaceted rapport between its constituent parts and that committed itself to working together for the longer-term project of ending the war once it had started. Do we have, therefore, a negative balance sheet for the antiwar movement? I think we unequivocally have to say no. The antiwar movement was unable to stop the invasion and occupation of Iraq, yet the movement undoubtedly shaped national and international politics in a valuable direction. The antiwar movement limited the space for the US intervention and occupation of Iraq, it kept the pressure on Western politicians to bring the troops home, and the existence and size of the movement was a significant asset for the people who resisted the occupation in the Middle East using arms. It also had a big impact in the Middle East more generally – can we, for instance, understand the beginnings of the Egyptian revolutionary process without the pro-Palestinian movement and the boost it received from the antiwar movement in the West? An important victory for the antiwar movement was the delegitimising and, later, the final defeat of the US hawks’ neoconservative plan for the Middle East. This defeat must take into account the antiwar movement. It is crucial to recognise that the interventions we see today are not the ‘continuity’ of the Bush plan for a new Middle East. Yes, it still tries to reassert an imperialist hegemony, but in a drastically different environment. The antiwar movement played a significant role in that. And most significantly, the resounding victory of Obama, and defeat of Bush, cannot be understood outside the impact of the antiwar movement. I think this is the case in Australia as well, and the defeat of John Howard – both in the defeat of his government and his defeat in his local seat – are important reflections of the impact of the antiwar movement alongside other factors. That Obama, Rudd and Gillard proved to be more of the same in many ways is not in dispute. What we must acknowledge is that at the point Bush and Howard launched the war on Iraq – at the point our movement failed to prevent the attacks – many threw their effort into the defeat of those two leaders. In the US, activists moved into the Democratic campaign around Obama, and here many activists moved into campaigning for the Greens. This was a dynamic observed by social movement researchers in both the US and Australia, including in my own research on the impact of the September 11 attacks on the Global Justice Movement. The other observation made, and I’ll use the language of the US academics who have looked at this question, was that there was a spillout from the Global Justice Movement into the antiwar efforts and then subsequently into electoral work. By spill-OUT I mean the shifting of effort and resources from the Global Justice Movement – from a movement with anti-systemic politics – into the antiwar effort with its narrower frame of ‘No War’. This is not what occurred in other periods of anti-systemic movements, and is clearest when we look at the 1960s, where the dynamic was more of a spill-OVER, with movements drawing strength and weight form each other. It was a time when movements bolstered one another, and did not vacate one field for another. But when it came to Iraq, the Global Justice Movement vacated in favour of the antiwar movement. This observation is important, as while we wanted to and needed to build the broadest possible movement against the war – hence the unifying slogan of ‘No War’ – there was a problem in that the radicalism and alternative future focus of the Global Justice Movement was excluded. It made it difficult to combine a critique of imperialism or capitalism with a critique of war; this combined critique was something that the movements in Australia and the US found difficult, although it was better achieved in certain European countries. For example, the slogan at the initial Barcelona mobilisation over Iraq was ‘Against a Europe of Capital and War’. These two processes, of spillout and looking to electoral solutions point to something else, too: the lack of a coherent and independent Left politics within the movements in Australia, one that could have not only protested and made powerful ideological claims, but could also have challenged the political elites on their own terrain. Movements do not proceed along linear paths – neither the Global Justice Movement or the antiwar movement – and nor should we expect them to. But it is in understanding movement successes and victories, as well as failures and collapses, that we can better understand the political period and how to regroup for the ongoing effort of building a safe and just world. I raise these issues as a starting point in a discussion about how the events of ten years ago might be understood, and how we might better understand how to build a Left project in the here and now. was active on 9/11. She is in good company here with other left-wing gatekeepers such as Tariq Ali, Chomsky, J Pilger and A. Loewenstein’s favorite TV show “Democracy Now”, financed as it is by undisclosed US foundation monies (see the DN website). But see if you cannot find an elderly Duntroon grad, Ms. Humphreys. He will tell you how he studied in officer training the British use of counter/pseudo-gangs, as they are known, in the UK counter-insurgency in Malaya against Chin Peng, and against the Mau-Mau in Kenya in the 50s. The key book is Gangs and Counter-Gangs, Gen. Frank Kitson, 1960. Continue with “turned” IRA men as pseudo-gangs in Ulster in the 70s. And then if you read Italian, look at who was actually running the Red Brigades and why. Go on to consider the overall nature of “false flag” attacks in intelligence work, and why this is relevant to the 2 explanations of 9/11: LIHOP (let it happen on purpose) and MIHOP (make it happen on purpose). Consider that Al Qaeda does not exist, that we have learned from US websites in the last few days that the entire 9/11 commission report is based on third-hand hearsay obtained under torture. Consider if you will why such men as the ex-NATO commander in Yugoslavia Gen. Wesley Clark (not to mention about 2,000 US architects and engineers and many other military men) has publicly called for a proper investigation of what happened on 9/11. An investigation which left-wing gatekeepers see as superfluous, because they already “know what happened” (sic): “brave Third Worlders hit back at Empire” and it is “racist” not to allow them the talent needed to outwit 16 US intelligence services and all those of all other countries in complete discretion while working out of an Afghan cave. Can it be that thanks to the ABC/SBS and Fairfax/Murdoch you are not aware of the recent conference in Kuala Lumpur, keynoted by Mahathir, on 9/11? It was attended by many. Consider please the nature of Deep Politics as outlined by Peter Dale-Scott, among many others. Or do you still believe the Ananda Marga did the Sydney Hilton Bombing of 1978? Exactly: and any soldier will tell you that tactics (how to win a battle) are part of strategy (how to win a war). 9/11 was just such a tactic. Concluding, I suppose I should be touched at the left-wing gatekeeper per se: like the populace at large, she too seems to have a childlike need to believe that “her” State would never kill her and hers, or permit it to happen. Still, the US antiwar movement too refuses to face up to how 9/11 happened, so it Aust. counterpart seems to be in good company. Until that company breaks up and antiwar people understand what happened and is still happening (Islamic takfiri as pseudo-gangs of NATO in Libya and Syria, ably supported by Bob Carr calling for the murder of Pres. Assad), Humphry’s “wish to understand the events of ten years ago” will remain unfulfilled.